You could have been on your way to the washroom or even going to quench your thirst, but once you heard his name being announced and he stepped on his stage shouting his trademark punch line âHit de Horn!â, all other needs and wants became second priority. 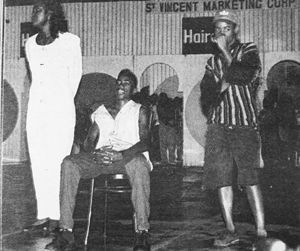 In 1988, at the tender age of age eight-years-old, Christopher jumped onto the music scene straight out of the Layou Government School and into the Junior Calypso competition with his song entitled âThereâs room at the topâ. He placed second, but that was only the beginning. The next year, Christopher won and repeated the feat in 1990 with his song âRich and Famous.â He also won in 1992, 1993, 1995, 1996 and 1997. At the age of 10, Christopher suffered a slight set back. He was banned from calypso for a year after controversy erupted over his participation in the Senior Calypso Tent. This, however, did not deter him. Now 28 years old and residing in Brooklyn, New York, Christopher spoke with Searchlight about his life via telephone. Christopher stated straight off the bat that his inspiration for music came from the ABC of Calypso, Alston âBeckettâ Cyrus. âHe is the one that really made me want to do music,â Christopher recalled. With each win, Christopher was adding more than just calypso titles and trophies to his belt; he was becoming another famous name from his hometown of Layou. This central leeward town has produced more than its fair share of talents such as Major League Soccer (MLS) star player Ezra Hendrickson, renowned surgeon Dr Cecil Cyrus and Governor General Sir Frederick Ballanytne, and, of course, Kemmieâs sister, Womenâs National Basketball Association (WNBA) superstar Sophia Young, just to name a few. Even after winning all the titles, Christopher said that the nationwide attention he received never really got to his head. âI just used to see it as performing because its something what I loved doing,â he stated. After migrating to New York in 2000, Christopher linked up with band âSolidâ, consisting of Vincentian nationals. He has since moved away from the political and social commentary and has embraced the Soca art form. Since the formation of the band over five years ago, Solid has performed all over the United States. Speaking with Kemmyâs mother Annie Christopher, who still resides in Layou, she described her son as a âsinging freakâ. âEverything this child did, he was singing, even if he was sweeping the yard he was singing,â the proud mother recounted. Christopher mentioned that she admired her sonâs bravery at such a young age to perform in front of throngs of people. âAnytime you heard Kemmy was going to perform in park (Victoria Park), the whole of Layou used to be empty, and when he won, it used to be a party in the streets,â she stated. His Uncle, Wollis Christopher, the man who wrote all of Kemmyâs songs, said that the young man was oozing talent from quite a young age and that he was a quick learner. Wollis mentioned that Kemmy was always singing as a child, but he never took him seriously until someone told him that he should work with Kemmy and let him showcase his talent. The proud uncle recalled writing two verses of a song for Kemmy and letting him learn the correct chords on his own. âI was testing him to see if he was ready. When I came back I was surprised to hear that Kemmy had learned all the correct notes and chords.â His uncle mentioned that Kemmy was one who loved what he was doing and would critique his work until it was perfect. The highlight of Christopherâs career came on July 12 last year while performing at Six Flags Theme Park and performing on the same stage which his idol, Trinidadian Soca artiste Machel Montano, had performed on. âJust seeing him in action was crazy. Words canât even begin to describe how it was,â he commented. As life comes with it highs and lows, Christopher was a first class passenger on that rollercoaster. Shedding light on his personal life, Christopher said that he was not a well-behaved child growing up in the town of Layou. He noted that it got worse when he went to the United States. âI used to be living quite a crazy life, partying hard, not reaching home until sunrise and getting into fights. Almost every time you heard my name, it was me arguing with someone. It was just crazy, man,â he related. Redemption, however, for Kemmy, came in quite a bundle, a bundle of joy that is. He welcomed his daughter Ayanna into the world four years ago. âShe has just changed my life tremendously. I am more focused now, I donât party as much as before, and I have learned a lot from my mistakes and it has made me see life in a whole new light,â he added. With that being said, Vincentians should not have to wait any longer to see him on stage again as Kemmy will be making his splash for Vincy Mas 2009. With exuberance and confidence, Christopher said âExpect the comeback from Kemmy, Iâm going to bring nothing but hype to the music. Big things are going to happen,â he noted. Kemmy is also keeping close to his roots by working with young US based Vincentian producer Ramon âFryktionâ McDowall. He is of the opinion that soca music in St Vincent is at an all time high, with Gamal âSkinny Fabulousâ Doyle taking the world by storm. âI think we rank among the best right now. our music is of the highest quality,â he said. Christopher also admires the work of Zoelah, Icon, Problem, Child and Luta, among others. His goal for the New Year is to lay down tracks with Bomani. He would also like to work with Machel Montano. When he is not busy entertaining a large crowd, you can find Kemmy spending quality time with his daughter or playing soccer. He is also a radio personality on True Caribbean FM radio station in New York. Even though New York is his new home, Christopher made it clear that St Vincent and the Grenadines will always be in his heart.